Samsung Vibrant 4G on the way February 23? | Android Blast! Android Blast! 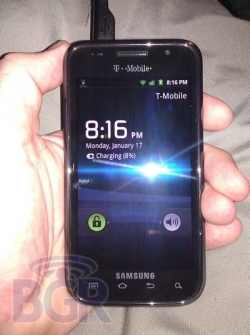 > News > Samsung Vibrant 4G on the way February 23? Samsung Vibrant 4G on the way February 23? The rumors have been flying about the Samsung Vibrant 4g becoming a reality, and it looks like we have a bit more than rumors now. Multiple sites are breaking the news that the Vibrant 4g will hit T-Mobile on February 23rd. TmoNews has a ninja that sent in a roadmap which indicates February 23rd as the launch date. BGR has published the above pic as proof from one of its ninjas that the Vibrant 4G is indeed a reality. The Vibrant 4G will sport a 21Mbps HSPA+ radio that will handle T-Mobile's 4G network. It will have a front facing camera, a 4-inch Super AMOLED display, and will run Android 2.3.